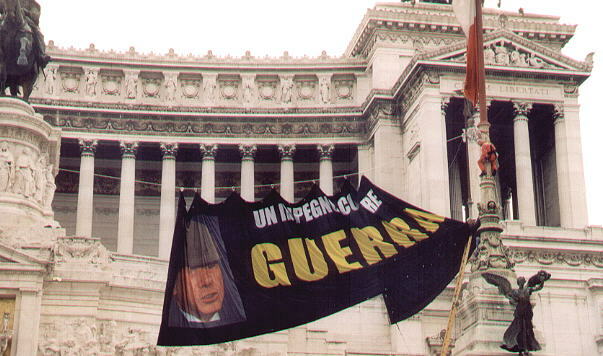 Mr. Silvio Berlusconi, the Italian PM who took office in June 2001, claimed that the success of a March 2002 mass gathering in Rome to protest against his labour policies was due more to the beauty of Rome, than to a genuine negative opinion about the legislation he wanted to introduce. There is an element of truth in this statement: Trade Unions organized and subsidized the trip and many took the occasion to spend a day in Rome. The event was the first large rally after the clashes which had taken place the previous year in Genoa during a G7 and had caused extensive damage, many wounded protesters and policemen and even a casualty, killed by a stray bullet, fired by a young and scared policeman. 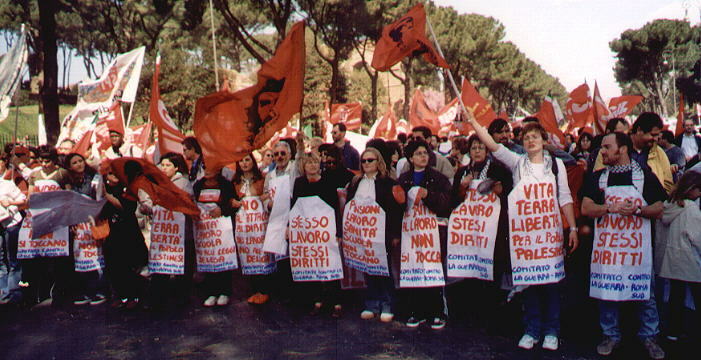 But while in Genoa the protesters belonged to different groups, including some violent ones, in Rome the event was well controlled by the Unions and this ensured its peaceful development. The events which led to the 2003 war in Iraq and its violent and never-ending aftermath caused a lot of uneasiness and anxiety in many people. These feelings were behind the massive participation in the rallies organized to prevent the war and subsequently to call for a different approach to the many issues the intervention had raised. While rallies organized by the Unions are very structured, these other rallies left more room for individual participation. The smiling faces of the protesters showed the satisfaction of voicing their views. The attendance at the rally which took place in February 2003 was estimated by the organizers at 3,000,000 while the police set the number of participants at 800,000, but both agreed that during the event not a glass had been broken and not a teaspoon had been stolen. 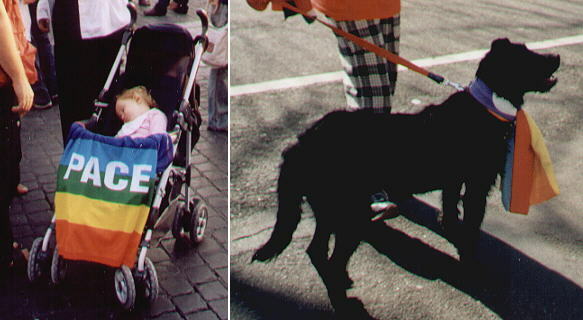 The confidence that these rallies had not endangered anyone encouraged many to go there with the whole family. 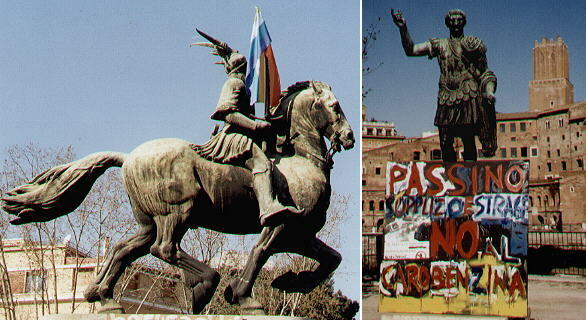 The monuments of Rome are often used by protesters to support their views: in some cases the result is pretty amazing: Giorgio Castriota Skanderbeg (Skanderbeg = bey Alexander) was the son of an Albanian Prince, sent by his father to the court of Sultan Murad II. He became a military commander of the Ottoman Army until in 1443 he led a rebellion of the Albanians against the Sultan's rule and for twenty years by using guerilla tactics he managed to circumvent the Sultan's attempts to regain control of that country. He is remembered for some particularly cruel massacres. In 1939 the King of Albania was dethroned by the Italians and the title was assumed by the King of Italy: to celebrate the friendship between Italy and Albania a monument to the Albanian hero was erected in 1940 in the large alley leading from Circo Massimo to Porta S. Paolo. It is highly unlikely Skanderbeg would have objected to the war in Iraq. T-shirts with the portrait of Ernesto "Che" Guevara (1928-67), an icon of the 1960s, are still well sold at peace rallies. For those who are not fully familiar with Italian matters the number 5 on some t-shirts is a reference to a TV channel owned by Mr. Berlusconi. There are more spectacular ways of voicing your views than just walking about with a flag. Two Greenpeace activists climbed the flagpoles of the Monument to Victor Emmanuel II to spread out a large band mocking Mr. Berlusconi's foreign policy. Mr. Berlusconi was not pleased at all, especially when he learned that according to the Italian law the two activists could not be charged with any criminal offence. In 2003 the Mayor of Rome called for a night rally from the Capitol to the Colosseum. The participants were provided with torches and their march had a close resemblance to the processions of the past. 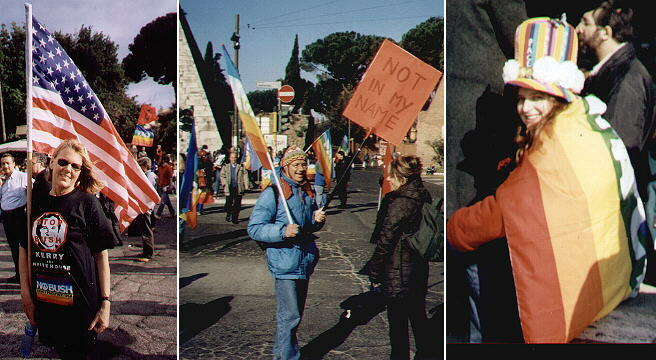 The success of the initiative was such that a similar rally was called in September 2004 when two Italian aid workers were seized in Baghdad. e) Circo Massimo: very large rallies (more than 1,000,000).